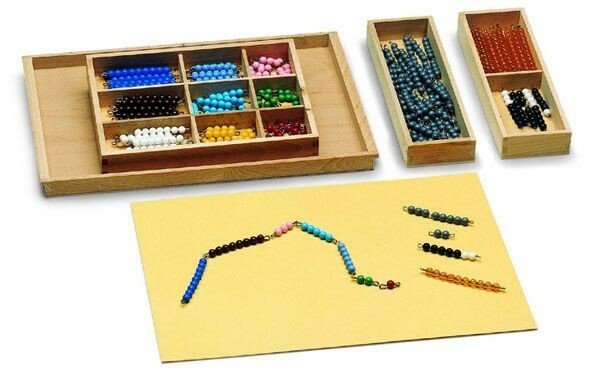 Wooden tray containing: a) a compartmentalized wooden box with ten bars of each of the colored bead bars 1-9; b), a wooden box with five bars of each of the grey bead bars 1-9; c) a wooden box divided into two compartments and holding a black and white bead stair 1-9, plus 20 golden bead bars of ten. The printed notes of this Montessori presentation from our CME Teacher Preparation Course are available for purchase from this webpage. Please search for: Subtraction Snake Game.